Revere Ware (aka World Kitchen) sells very few lids anymore for their copper bottom style cookware. Our latest check shows two lids, a 10″ and one listed as fitting 2 and 3 quart saucepans. For owners of vintage cookware, specifying lids by capacity means little as the sizes varied over the years for a given capacity. By far the best places to get replacement lids for your copper bottom cookware are your local thrift store, where you can often find a large selection of lids, or Ebay, if you want to find a very specific size. As of this writing, Ebay lists about 100 lids at auction. We’ve created a site, revereware.org that sorts all Revere Ware listings on Ebay sorted by type and size, and you can find all the lids here. To find the right lid for your cookware, choose a size that is listed with measurements the same size or slightly smaller than the inside diameter of your cookware. Revere Ware lids are usually just slightly smaller than the cookware they fit. 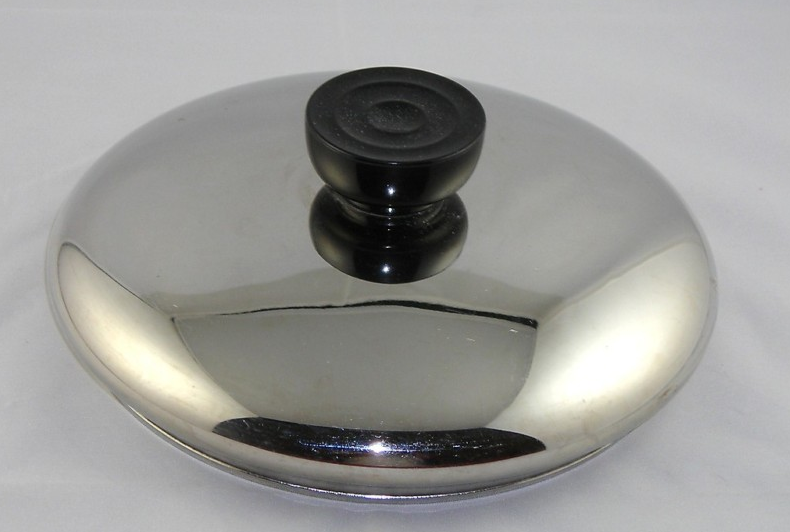 Ebay listers will show this as anywhere from 1/16″ to 1/4 inch smaller than your cookware diameter. Very few Revere Ware pots in our experience have a diameter that is NOT a whole inch; exceptions we have found include a 6 1/4″ skillet (that takes a 6″ lid) and 5 1/2″ saucepans. However, based on auction listing we’ve seen, there do appear to be 6.5″ and 7.5″ sizes as well. Need a revere ware lid for an pan that messures 7 1/4 inches. You are likely looking for a lid that measures 7 inches in diameter. This is a very common size. Can you tell me if the 10″ skillet lid also fits the 8 quart stock pot? There is no one answer to your question. Over the years, Revere produced a number of stock pots in the 8-quart capacity, with different diameters. The standard vintage stock 8-quart stock pot (I.e. that uses the vintage 2-screw handles) takes a 9-inch lid. There may be some variation they made at some point that uses a 10-inch lid; it is hard to say with any certainty. I have the cooper bottom revereware pots and pan set that I have had since 1990 I received as a wedding present. Last night I dropped the lid for my 2 quart saucepan and it broke. I was wondering where I can find a replacement lid? It is a glass umber/brown color that fits a 2 quart saucepan. Please help? I’ve never seen a clear glass lid on the standard copper bottom Revere Ware cookware, and I haven’t seen any for sale on eBay. My suggestion would be to look for a replacement glass lid on Amazon.com. We’ve purchased several standard sized glass lids there with good results.